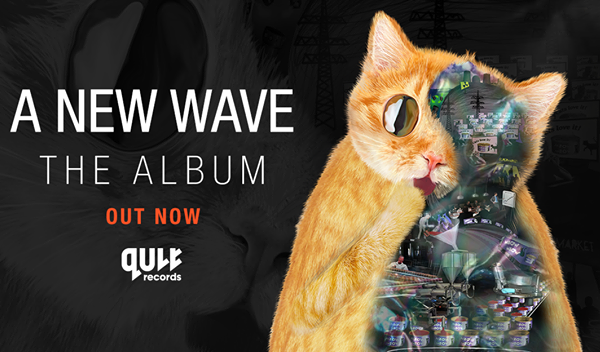 Intense, Catchy & On-Target: Geck-o Presents “A New Wave” (Review) ‹ ALIVE AT NIGHT – Hard Dance Interviews, news & reviews with a twist! When I had learned that my all time favourite experimentalist was producing an album, I could barely contain my excitement. After tracks that had changed my life and my perception of music itself such as “Soul Train,” “Dancing Machine” and “It’s What We Are,” the token hipster of hard dance music, Geck-o undoubtedly had some huge shoes to fill. When interviewing the legend himself about his album, he pointed out a notion of this “new wave of music that has never been created before,” my curiosity towards this statement was ever growing and I was curious to see if he had stuck to his word. Was this really a new wave? Has this ever been done before? Listening to the continuous mix (as I was advised to do) was meant to give a special feeling and flow to the album and saying this, I am listening to “A New Wave” in its most purest form, from natures intention. From the very first minute of listening to “A New Wave,” (the title track) I experienced an array of sensations throughout my body that I haven’t felt in a long time whilst listening to music. The intensity of this intro was so incredibly overwhelming and this emotion and feeling is something that lacks a lot in nowadays electronic music. I mean, making music over a computer and generating a real life emotion is quite difficult and I really applaud Geck-o for grasping the emotional concepts from the very first track. No, it’s not hardstyle, yes, it’s slower and doesn’t have a huge distorted kick, however it is still extremely powerful and effective. The second track, “Wappie Love” was one that I had heard tossed around throughout a few podcasts and within sets, so I was already familiar with the track, however built into the continuous mix it had again, a different effect on me. As an extremely malleable track and one of the harder tracks on the album, in my opinion, it can be easily meshed into hardstyle sets. The intensity and combination of the different sounds that work together is incredible and this track even packs in some old hard trance influences. Track 3 “Numb” is the definition of ‘trippers paradise’. Knock back a few LSD tabs and this song will instantly become your best friend. Just kidding, but really, this song reminds will most likely remind everyday ‘trippers’ of being in the midst’s of an awesome trip. Somewhere around 13 minutes into the continuous mix the energy was kicked up immensely and my senses were heightened yet again. “Switch Back” has got to be (for me) the standout track of the album. It’s seriously got some groove and some charm to it and to put it plainly I can see this one having a lot of playing time in my life. Another noteworthy opinion is that it’s really energetic and ‘gym-worthy’ and mind you, this is coming from the mouth of somebody who only listens to hardstyle whilst working out. The transition from the story-telling “The Cell” (with Mandi Astola) and “Shakedown” is also another highlight for me. From the sudden story within the album and the bare melody of Shakedown, the atmosphere suddenly shifts and is pulled back in order to build up once again. Bringing back that old Geck-o sound again (but slightly slowed down) and some old hard trance influences and even some modern “Future Classic” influences, “Shakedown” is a mixed pot of experimentalism – and I love it! 27 Minutes in and I have floated on a little cloud to heaven and records have been broken. There are barely any tracks out there that make me think “awww this melody is so cute, I want to give this track a hug,” and I think that Geck-o just took the throne. Breaking the record for the cutest melody that I have ever heard in my life, “Craving” reminds me of a sneaky cat that creeps through the streets at night (don’t ask me why – I have a vivid imagination). “Lekker Sapje” is described by Geck-o himself as “the only track classified as hardstyle on the album” and you can definitely hear that with the sudden change of tempo. Within the continuous mix this keeps the energy high and is more of an enjoyable ‘dance-floor track’ than something of deep listening. Just when you think that things will continue on a high tempo, it slows back down with another vocal piece with Mandi Astola “Floor 8.” “We’re all mad here, the animal spoke…” The two vocal pieces within the album are something that I’ve definitely never heard before on an album – it’s something I do hope to hear in the future because it really does split up the album to tell a story rather than just showcase music. Track 11 “Big Brother” brings some older drum and bass/dub influences in which was really great to hear folded in with Geck-o’s experimentalist edge. It reminded me a little bit of Danny Byrd’s music which is a really fresh and uplifting take on drum and bass. Yet another astonishingly intense track with so many different elements, I think it’s safe to say that an eargasm is on its way. Teaming up counterpart experimentalist Wavolizer to create “Honey Pls,” the melody in this one is so simplistic, yet so powerful and although the ‘crunchy’ sound comes in and is slightly unbalanced for my ears, the softer parts of the song are still great. Towards the end of the album comes “Space Pilot” and it has that true Geck-o sound and driving force that he does best within his tracks. Giving me the picture of actually being in a spaceship, I think it’s safe to say that Geck-o has filled his shoes in bringing a huge front of new music that has never been made before. I’m not going to lie, when I spoke to Geck-o about the album and he mentioned that it wouldn’t be a hardstyle album I felt slightly disappointed that he wouldn’t be making music of that “Soul Train” vibe. However, once I began listening to the album in depth I found it to be a sensory experience. I was literally hearing colours and tasting sounds and I feel as though not many artists have the ability to do this to their listeners. As one of the most under rated producers in hard dance, Geck-o has really proved his capabilities with a whole album of immaculate music that is has a huge realness to it. Never one to produce music for the masses, Geck-o has stayed true to his musical passions and drive to make something different and this is something that I can applaud. Although it’s something different and not the standardised hardstyle sound, “A New Wave” has character and charm and an intense driving force that makes you actually want to concentrate and immerse yourself in the music. Alive At Night’s personal picks include: Switch Back, Craving, Shakedown & A New Wave! So, Geck-o, to answer your question – yes, you fit the shoes! Click Here: “A New Wave” is available on iTunes for purchase.